October 22 was the official start to the cold-stun sea turtle season on the Cape, a relatively early start. Four Kemp’s ridleys, the most endangered of all sea turtles, were rescued that day in Eastham and Brewster. Bob Prescott holds a very small Kemp’s ridley netted from a marine life cruise out of Sesuit Harbor in Dennis. Given that the bay temperature was still relatively warm, finding our first cold turtles was a bit of a surprise. Still, we had had inklings that the turtles were on their way. Spotting or finding sea turtles, despite the Cape’s cold-stunning phenomenon, is pretty rare. When sea turtles venture north in the summer, they are usually well offshore. The only time they’re spotted is usually by boat or when they’re killed or injured and wash in. So two weeks earlier, when two basically healthy Kemp’s ridleys on the same day were recovered on the Brewster flats, we took notice. Then, a week later two ridleys were spotted swimming in the bay during our marine life cruise on the Albatross. A crewmember managed to net one turtle, despite very choppy sea conditions. 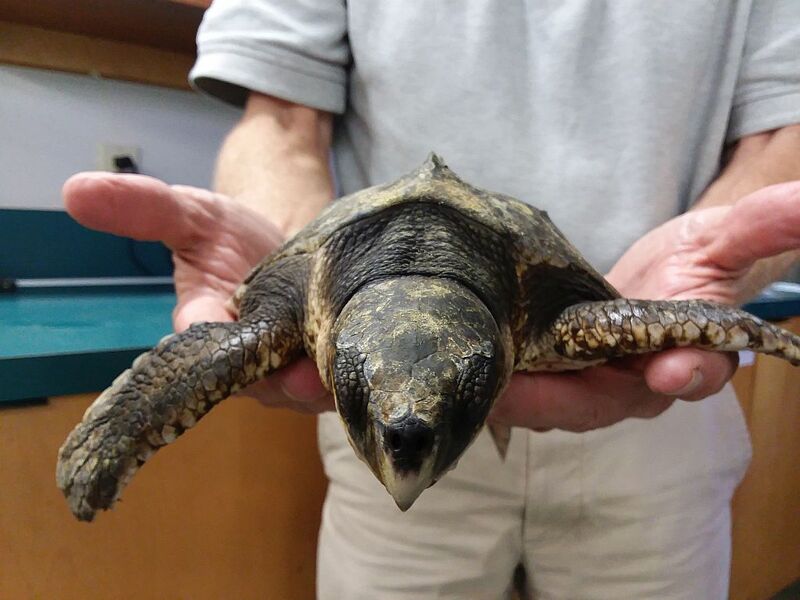 The lively turtle was brought back to our wet lab for weighing and measuring before joining the two Brewster turtles for assessment at the New England Aquarium. This turtle and the others give the aquarium a rare chance to examine sea turtles before they slip into cold-stunning. The aquarium reported that the internal body temperatures for the turtles were in the range of 72-65 degrees, definitely not cold-stunned, which is usually 50 or below. Then a week later, our first cold turtle washed in with an internal temperature of 47. Cape Cod Bay was still about 57 degrees. So what’s going on out there? Sanctuary director Bob Prescott, who has decades of cold-stunned sea turtle experience, has offered one educated guess: Recent turtle recoveries have all occurred in areas with extensive tidal flats. Perhaps the warmer turtles spent less time exposed to colder air temperatures (by not being exposed to multiple low tides) but the cold-stunned animals were less fortunate. When you factor in the many ridley and loggerhead sightings this past summer (which Wellfleet Bay tracks), it does have us thinking the sanctuary will be a busy place this fall. This entry was posted in Updates on October 24, 2018 by Wellfleet Bay.